Guys I'm really sorry about this thread. I am so freakin busy with other projects at the moment, I just don't have time to sift through pics and post them yet, but I will as soon as things settle down. I look forward to see what kind of treasures that you've unearthed from the archives. I'd love to see more rare photos of our favorite Sith Lord. Am slowly re-uploading the pictures. Man, that took some pins. Re-uploaded all the pictures... still cannot find those pesky Disney Vader pictures. Grumble, grumble. If anyone have pictures of the Disney appearance, please post them up - or other pictures of appearances with dates and locations are appreciated too. Concentrating mainly on ANH, but if people have pictures of the ESB and RotJ tours too, then it would help for when those lists get compiled. I must admit that I have only limited ESB and RotJ tour reference pictures collected... and it's harder to keep track of those as things had exploded by that time in terms of tour suits and appearances. But still worth posting the pictures, in my opinion. Also, I think I uploaded the ANH pictures in their full size, compared to previously where Photobucket compressed some of the larger ones. Thanks for the cleanup Carsten. It seems we may be missing a few pics, but maybe not I haven't had much time to even touch this thread. Disney pics back up. WOW, I don't remember them being this good quality. Just strange it was something I had in my photobucket folder initially, as it's not pictures I generally had. Weird. Oh... I believe there is a double of one of the pictures. Yep there was, I corrected it. My next task is to re-upload the Ninja Turtles pictures... and your task is to copy and paste the first post in this thread into the first post of the same thread on the RPF! 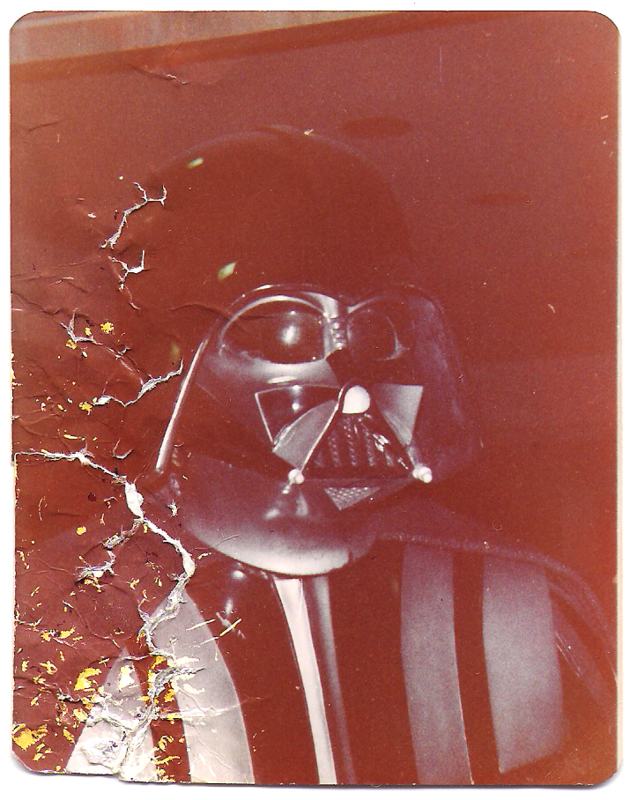 I went to see Darth Vader at Ridgmar Mall in Fort Worth, TX on July 23, 1980 and snapped 2 pictures using my Kodak Instamatic 20 with the flash. The result of the flash was that it highlighted the gray colors of the faceplate. Unfortunately, our dog Suzie chewed up the left hand side of one of the pictures, and I haven't been able to find the negative. Newspaper clipping of ad and story for the event are also uploaded. 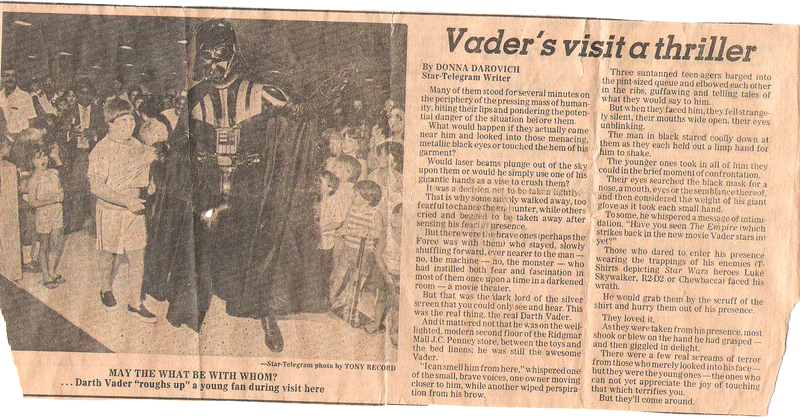 Having the standard Don Post helmet at the time, I was astonished by how big the "real" Darth Vader helmet was! Last edited by banthapoodoo on Wed Aug 09, 2017 7:20 pm, edited 2 times in total. Cool story and love the pictures. 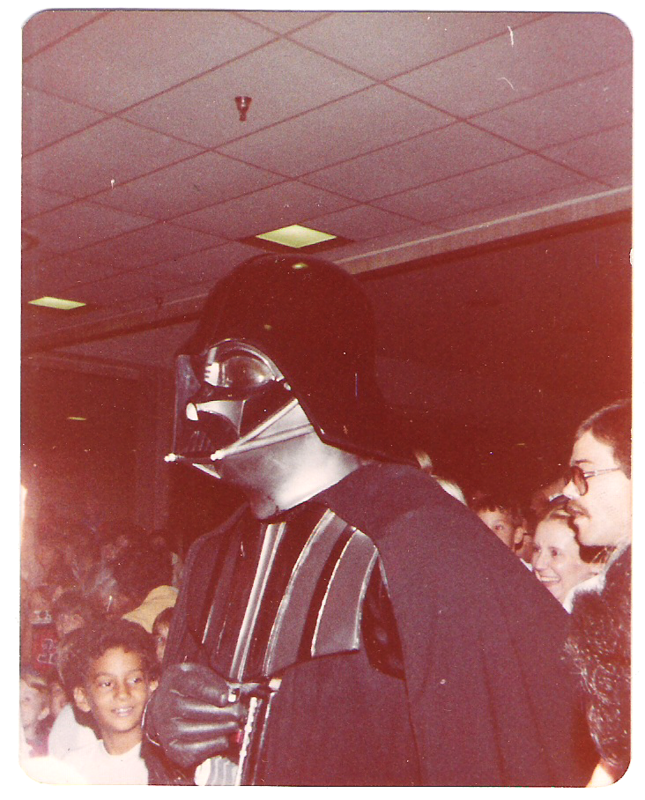 By 1980 they had multiple Vader's touring and this appears to be a standard tour suit and not the original ANH screen used suit that Kermit Eller wore for his ANH tour. It looks great and thanks for sharing. 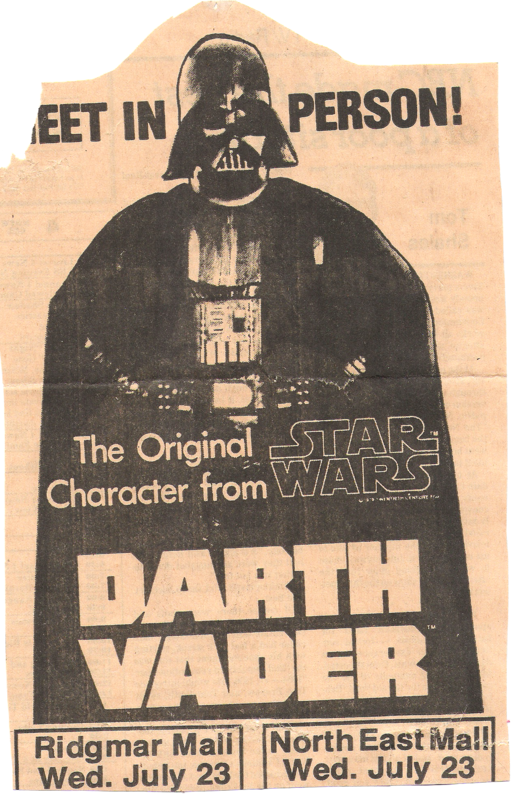 outside the movie or in a publicity photo back in 1977. Thanks. Had to redo the links again as imageshack has decided they don't allow thumbnail linking to the full scale pictures for free users. And now I maxed out my free user account on imgur and need to find a new service. Bummer.